For parents, one of the most enjoyable things in life is seeing their child’s eyes light up upon seeing something they totally didn’t expect. Wouldn’t it be great if such occurrences happened more often? Well…they can – with a little help from science! In this article, we describe three safe and fun experiments you can conduct with your child right in your own home…or, at least, in your backyard. You’ve probably seen this experiment at some point in the past few years, but in case you forgot, we’ll provide a little reminder. This quick, easy, and messy experiment can help you introduce the idea to your children that, when put together, certain materials will react in crazy, unexpected ways. The reason the “explosion” occurs in this experiment is due to a physical reaction, rather than chemical. Essentially, the miniscule holes in the Mentos candies cause a large amount of bubbles (filled with CO2) to form around each piece. As the Mentos sinks, the bubbles surrounding the candy pop – causing CO2 to bubble to the surface – and then some! The next experiment, while similar, deals with a chemical reaction – allowing you to explain the basic difference between the two phenomena to your young scientist. Don’t throw away that now-empty soda bottle just yet; it’ll come in handy for this experiment! In this experiment, the change is caused by a chemical reaction (the hydrogen peroxide breaks down into water and oxygen), with the yeast causing the reaction to occur rapidly. The soap catches the oxygen, causing the soap bubbles to expand (similar to the bubbles bursting in the previous experiment). All this might be a bit much for your little one, but it’s another great example of how different substances, when combined, react in different ways. 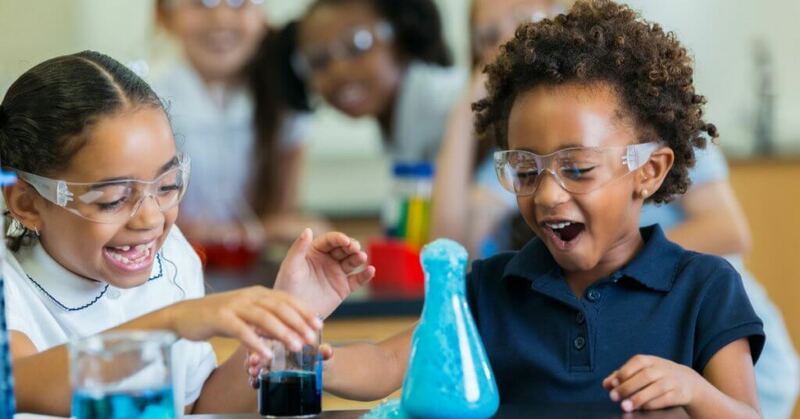 After this second experiment, your child will almost certainly be thinking about becoming a mad scientist and ready to embark on their next learning expedition! Now for an experiment your child can actually eat! Place the pencil over the jar so the string hangs down inside of it. Make sure the paper clip isn’t touching the bottom or sides of the jar. Take it out and place the string, etc. to the side. Along with furthering your explanation of mixtures and solutions, you can use this experiment to explain to your child the importance of being specific when measuring (whether doing a science experiment, preparing a meal, or something else entirely). Also, the fact that your child will have to wait to see results will help them strengthen their ability to withhold pleasure, and to remain patient in order to earn their reward. And, of course, there’s the added bonus of candy at the end of the wait! So…how did your kiddo react to these experiments? If they loved these quick little science activities, they’re going to love what we have in store for them at our Camp Little Scientist. Not only will we do some fun experiments with the little ones, but we’ll also dig into some of the other exciting aspects of science, as well. Registration is currently open, so if you want to give your child a week of educational fun this summer, get them signed up as soon as possible.